Advantages: Informative text, large number of varied profiles, different types covered by 4 view drawings. This is the 4th in AJaKS’s line of “Encyclopedic Publications” and this time they concentrate on the famous “Aunty Ju”. The A4 size soft card covers contain seventy pages with a further 16 pages in loose form. The main text is in English with nine pages being devoted to the Polish language. The captions are bilingual. The text follows the standard layout with a brief history being devoted to Hugo Junkers and his introduction to building all metal aircraft. The reasons for the building of the single engine Ju 52 are well explained, and the authors do well to explain the differences between each prototype. The development history of this famous aircraft is not totally clear and inevitably there are conflicting accounts of its progress. One of the strengths of this publication is that if there are different points of view, then all are given in the text. An example of this being the fate of the first prototype. For reasons of commercial viability it was inevitable that the aircraft would take on more engines. Safety was a big factor for airlines and so the Ju 52/3m was born. 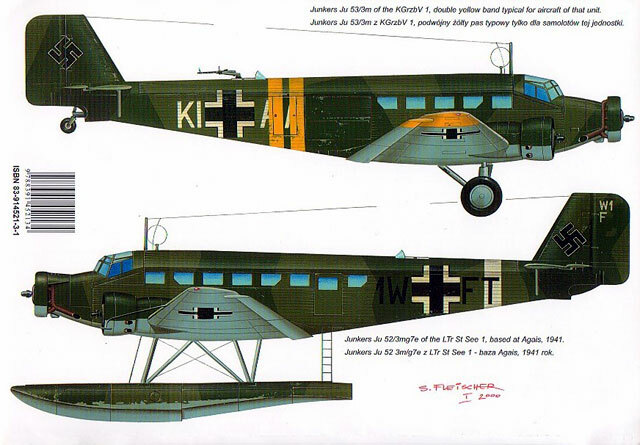 The Ju 52 was able to be adapted to many different roles and both civilian and military versions are discussed. The text is supported with an interesting selection of photographs that includes the prototypes, transport, cargo and combat types. The Ju 52/3m first saw combat use during the war between Bolivia and Paraguay where it was used for dropping supplies to the troops. Further action came during the Spanish Civil War and it is from here that the authors go into detail to describe the aircraft’s use until the end of World War II. For modelers, there is a chapter that describes the various kits and accessories that abound in the marketplace. Although these relate to the Polish market, all the usual suspects can be found. A book such as this would not be complete without scale drawings. The fuselage profiles take up the entire A4 pages and so it is the upper, lower, front and rear views that need the larger loose sheets mentioned earlier. These drawings cover just about any version one is likely to need. 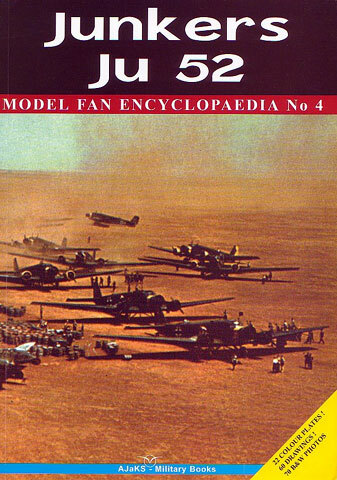 There are nine pages that feature the single engine version (later named the Ju 52/1m) and 28 pages that cover the Ju 52/3m. Very comprehensive. Colour profiles are not forgotten with 13 pages covering all types. These are all nicely done with a terrific variety of colour schemes. The authors have done an admirable job of presenting as much information as they have in a book this size. To do justice to an aircraft such as the Ju 52 would take a book many times the size of this one and consequently would be extremely expensive. Here we have an affordable book that any modeler of this aircraft should find beneficial.